Well things are happening out on the ocean, good things, like lots of fish showing up in multiple locations. It has been an interesting past couple of weeks actually. Here is a quick recap. Last week we had great fishing all through the weekdays and myself and other guides were anticipating good fishing on the weekend. We aren’t sure what happened, but the fish really turned off on Saturday. We could see them on the sounder in multiple locations but they just weren’t biting. Multiple guide boats had 1 bite all day, including myself, as we were all keeping in touch with each other, trying to figure out what the heck was going on. Captain Eddie did get on a decent bite that day for about 45 minutes and put a couple nice ones in the boat, but for the most part the fish were just not in the mood! I guess that is what keeps it interesting. Maybe the fish turned off because of the barometer change, the storm the night before, the algae bloom, we will never know. Sunday was a little better and we did box a fish and have some more bites, but it was right on the tide change and the bite only lasted 45 minutes. Fast forward to this past week and boom! The fishing is back on. There have been multiple good reports from the Hump this week, pretty much right on schedule. Basically, there have been fish encountered on the Hump, some over at Gower, Roger Curtis, Cowan, off the QA, and off the Bell Buoy. There have also been some fish in Howe Sound. Basically you have schools of chinook in the area swimming around looking for bait. Are they going to be on the Hump? Are they going to slide into Howe Sound? Are they going to get pushed towards the QA and Bell Buoy? The answer to all these questions is yes. It depends on the tide and the winds and where the bait is. Pick an area and stick it out, these are open water fisheries and you have to put your time in. Once you do find the fish you will usually be rewarded with some pretty decent action. Best depths for this fishery vary, but the most productive zone on the riggers is usually somewhere between 90-120. Stacking is essential for this fishery as it allows you to cover a lot more water and get a feel for how deep the fish are. We like to use 18 pound cannonballs to keep the gear down while stacking and still troll at a good quick pace. We have been doing well on a variety of glow flashers and glow spoons as well as bait in glow teaser heads. Salty Dawg, Green Onion Glow, Yellow/Green Kinetic are all excellent flashers for this fishery. Top spoons have been Pescas with glow and green, blue or black on them and top Kingfisher spoons have been Irish Cream, and Homeland Security. 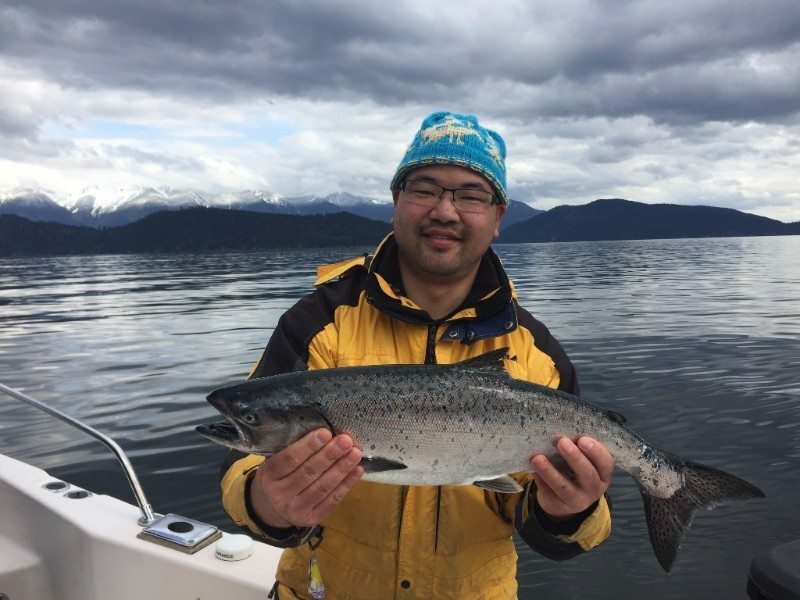 This is a great time to book a charter because we are usually get multiple bites, multiple keepers and these are tasty feeder chinook. Crabbing is also decent right now. I would recommend an 8 hour charter as sometimes it takes awhile to get on top of the fish and this can be tough on a 5 hour charter.